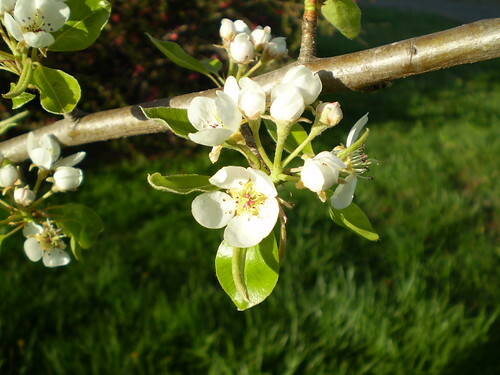 Last year we had pears for the first time on the pear tree I planted in the yard. I think it was 1995 or 1996 when I put a half dozen fruit trees in. Life changed and most of them are gone now. There's one little apple tree out by the grape vine fence that produces sad, scabby little apples in the fall. And there's the pear tree, brave survivor that finally produced a nice quantity of pears with no help from me! I've been a little worried about the possibility of fruit this year, though. Until yesterday I didn't see any bees or bugs on the blossoms. This year I'm hoping to have a garden again, after more years than I like to remember. I'm waiting for the neighbor to come to plow. It has been so wet and cool this spring that there haven't been enough dry days between rains for him to come out. Then we'll have to haul out the rocks...this is the mountain so there are bound to be rocks and till up the soil fine to get it ready to plant. The weather here until today could be called brisk, although some might say it has been miserably cold! I've been in the house spinning on these cool evenings, usually with sleeping dogs nearby and sometimes with the cat perched on the arm of the nearby chair. All of the wheels have something on them now. I'm still spinning the last of the Jacob wool from a Perfect Spot farm fleece on the old upright and I'm really enjoying spinning a beautiful variegated Corriedale fleece from Rising Meadow Farm on the Haldane upright. 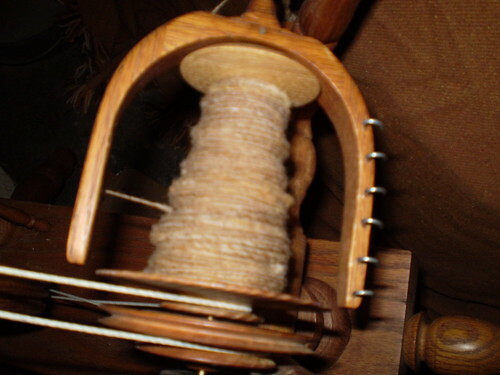 Pictured is a Border Leicester single on the Reeves wheel. The fleece came from a local farmer that moved away when she got married. I'm thinking to at long last get out my dye pots and overdye this yarn when I get it finished. I can't remember when I last did any dyeing! Looking forward to a busy weekend...tomorrow (April 25) is the Highland Games in Ararat, which is still in Patrick County and about twelve miles from Meadows of Dan. I've never been to such a festival so it should be interesting. I'll be in the booth most of the day demonstrating but I'm sure I'll be able to at least peek at the caber toss!